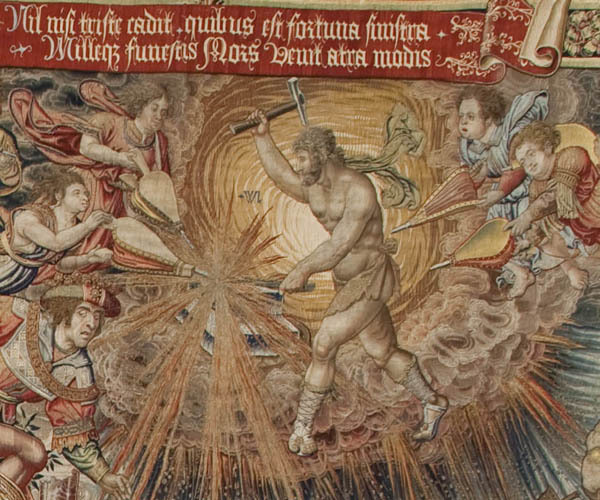 The tapestry series known as The Honours, woven by the acclaimed weaver to the Brussels court, Pieter van Aelst, was called The Fortune in the old inventories of the Royal Office of Tapestries. This set celebrated the election of Charles of Habsburg as Holy Roman Emperor in 1519 and his coronation in Aachen on 23rd October 1520. Charles, the son of Joanna of Castile and Philip the Handsome, had been King of Spain since 1516. The pieces illustrate the virtues to practice and the vices to avoid for the young monarch to achieve the highest reward. The royal collection of tapestries brings together an unparalleled set of masterpieces of Flemish tapestry, notably this monumental cycle of nine panels. Although the series was completed in 1523, Pieter van Aelst was forced to mortgage the tapestry to the agents of the Fugger in Antwerp because of financial difficulties. The weaver suggested that his creditors should first offer such a precious tapestry to His Imperial Highness, for whom it had been woven. This suggestion was accepted, and it was decided to send as a sample the central piece of the series with the allegory of Honour. 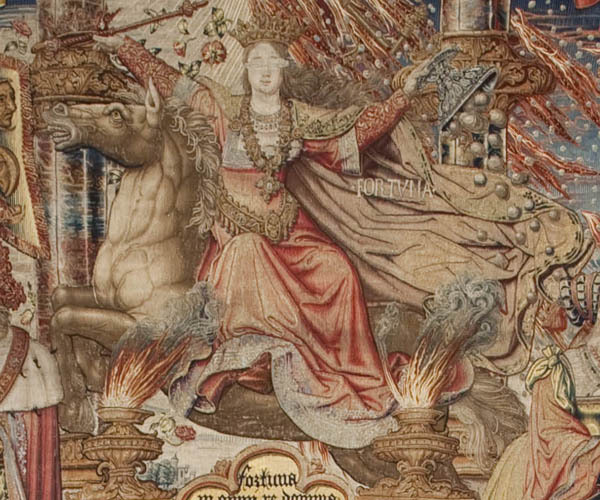 The tapestries were purchased when the emperor was in Seville on the occasion of his marriage to Isabella of Portugal in 1526. They were hung in the church of San Benito el Real in Valladolid in 1527 to celebrate the baptism of Prince Philip. They were first written into the inventory taken by Gilleson de Warenghien, the weaver to the court in Brussels, in 1544. As indicated by Charles in his will, the tapestries went to his son Philip II, and were inventoried from then on as belonging to the Alcázar of Madrid. The scene sequence in the nine Honours tapestries draws on the medieval system of accumulating analogous elements, with the figures arranged under the ideal hierarchy of the theme of which they are a detail. Moral qualities and antagonistic vices are personified in many characters from classical mythology, biblical tales, Antiquity and the Middle Ages. 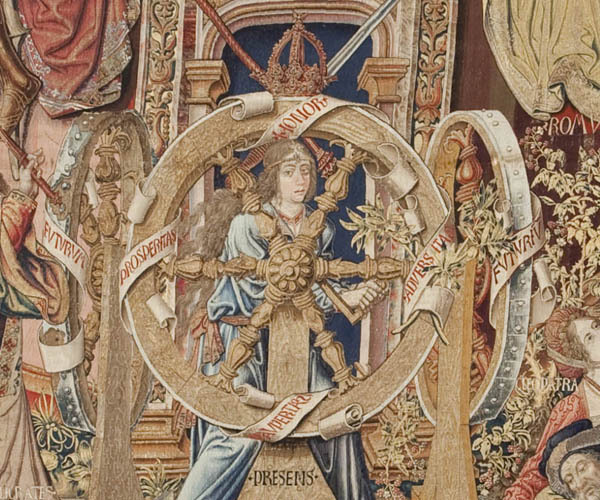 The tapestry can be classed as a woven Historia magistra vitae or as a manual of secular morals whose emblems and inscriptions are linked to programmes prepared for the joyful entries of monarchs and princes. The composition of the scenes, centred on an architectural structure or temple of virtue and structured in two overlapping levels, is a clear reflection of the ephemeral constructions and triumphal arches erected in cities for such occasions. The borders of flowers and fruits over a dark background show banners with Latin inscriptions alluding to the allegorical scenes in the field and also follow a Trinitarian inner scheme that reflects that guiding the series. The literary sources for this moral allegorical discourse on royal ethics are multiple. Noteworthy among them are the works of Alain de Lille and Jean Lemaire des Belges, not to mention classical works by Ovid, Valerius Maximus, Boccaccio and Petrarch, whose likenesses are woven in the central panel devoted to the Temple of Honour. The iconographic order distributes the nine tapestries in groups of three. The centre corresponds to the triad made up of the Temple of Honour, connected by the stairs with the tapestries corresponding to the Temples of Faith and Fame. This central triptych is flanked on the right by Fortune, Prudence and Virtue and, on the left, by Justice, Nobility and Infamy. This last tapestry ends the cycle with the representation of the ‘author’ or narrator. 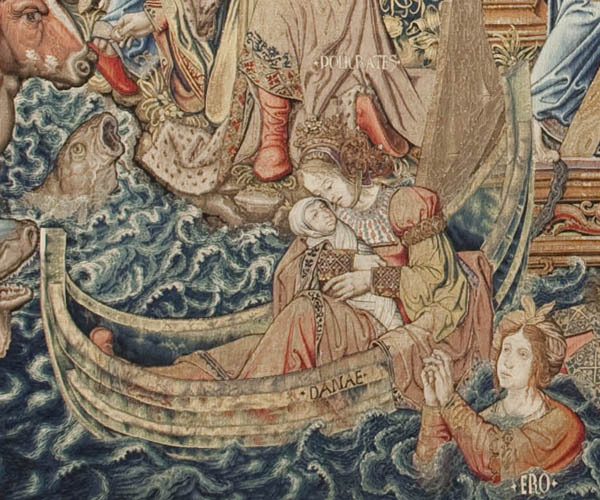 Iconographic analysis of The Honours indicates that the tapestry is a true reflection of the moral allegorical programmes related to royal ethics at the beginning of the 16th century. The tapestries illustrate the virtues to practice and the vices to avoid for the young monarch to achieve the highest rewards of honour, fame and nobility. The anonymous iconographic programme depicts Aristotelian ethics and the Stoic philosophy of the struggle of virtues against fate. Its author (or authors) were inspired by medieval works such as De Virtutibus et de Vitiis et de Donis Spiritus Sancti by Alain de Lille (c. 1150) and other contemporary works, such as Les Illustrations de Gaule and Singularitez de Troie (published in 1510-1513) by Jean Lemaire de Belges, a humanist at the court of Margaret of Austria. No document has been found giving the name of the cartoonists, who were probably many. No preparatory drawings have been kept either, but the series is unquestionably the work of several artists, including Bernard van Orley and Jan Gossaert de Mabuse. Since the 1950s, the nine Honours pieces have been kept in the Tapestry Museum of the Royal Palace of La Granja de San Ildefonso. They were installed under the guidance of Enrique Lafuente Ferrari, Fine Arts Director at Patrimonio Nacional. P. Junquera de Vega and C. Herrero Carretero, Catálogo de Tapices del Patrimonio Nacional. Volumen I: Siglo XVI, Madrid: Patrimonio Nacional, 1986, pp. 35 and 40. C. Herrero Carretero, Resplendence of the Spanish Monarchy, New York: Metropolitan Museum of Art, 1991, pp. 26-39. C. Herrero Carretero, Tapices y armaduras del Renacimiento, Madrid and Barcelona, 1992, pp. 55-64. G. Delmarcel, Los Honores. Flemish tapestries for the Emperor Charles V, Gante: Snoeck-Ducaju and Zoon/Pandora, 2000, pp. 46-58.